During the final debate, presidential front-runner Davao City Mayor Rodrigo Duterte said his major campaign contributor is "Emilio Aguinaldo." “Si Emilio Aguinaldo,” he answered when the ABS-CBN news anchor pressed him for an answer. In previous interviews, Duterte insisted that he will not accept campaign donations from anyone who has a vested interest in government to keep him away from a debt of gratitude. So who is "Emilio Aguinaldo?" We got some of the best answers from Duterte's supporters. A netizen posted that she needed to Google while analyzing the presidential candidate's figure of speech. She found out that "Emilio" means "industrious" in Latin and "Aguinaldo" is Spanish for "gift." Thus, "Emilio Aguinaldo" means "industrious people's gift" for Duterte. Another supporter said "Emilio" is a colloquial term for "volunteer" and "Aguinaldo" a Spanish word for "gift" (contributions). He said "Emilio Aguinaldo" stands for "volunteer contributions." "We are Emilio. Every Filipino working for change, participating in the campaign, making our own campaign materials, funding our own caravans. 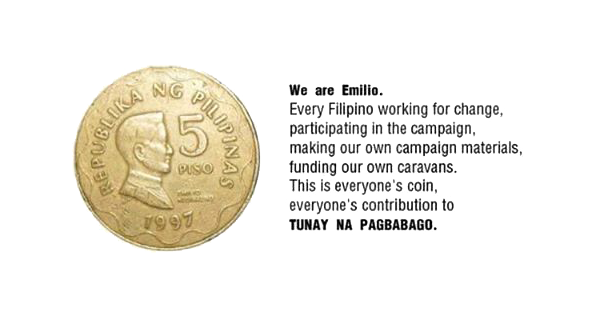 This is everyone's coin, everyone's contribution to TUNAY NA PAGBABAGO (real change)." "'Emilio Aguinaldo' actually represents the masses. Duterte is so witty you would think he was shallow. Emilio Aguinaldo represents the masses who are so passionately supporting the candidacy of Duterte. We may only have 5 pesos in our pockets, but we are millionaires by heart. We truly believe that by our unity, teamwork and dedication to Duterte, the minute pesos we humbly contribute will accumulate to the true voice of the Filipino People." With his strategies including this one, many concluded that Duterte is a "political genius."